Last week I had the honor and pleasure of being the first ever subject of a press interview conducted using Google Glass – followed up by a very interesting discussion with Robert Scoble. Here are some of the insights we’ve discussed, as well as some subsequent insights. Consider how phone-based cameras have changed photography. My eldest daughter is almost 9 years old. We have a few hundred images of her first year, and about 10 short videos. My son is now 18 months old, and as my wife was preparing his first scrapbook album last week, she’s browsed through several thousand digital photos. On my phone alone, I have dozens of video clips of him doing everything you can imagine a baby doing and some things you probably shouldn’t. The reason is simple – we had our smartphones with us, they take good photos and store them. And should I mention Instagram? Having information overlaid on top of your worldview is probably the sexiest feature from the perspective of us geeks. The promise of Terminator-vision / fighter-pilot displays provides an instant rush of blood to the head. And surely overlaying all of the great Google Places info on places, Facebook (well – Google+) info on people, and Google Goggles info on things – will be awesome, right? Well, my perspective is a little different. After the initial wow effect, most of these will be unwanted distractions. Simply put – too many signals become noise, especially when it’s human perception that is concerned. This lesson has already been learned with similar systems in aerospace settings – and there the user is a carefully selected, highly trained individual, not an average consumer. The art and science will be figuring out which of the hundreds of subjects visible is actually of interesting enough to “augment”. This will require not just much better and faster computer vision (hard!) but much better and deeper understanding of these subjects – which one’s really special for me, given the context of what I’m doing, what makes it so, and when to actually highlight it. Give me too much signal and I will simply tune out, or simply – take the damn thing off. Achieving this requires a deeper understanding both of the world and of the individual. Deeper, more detailed POI databases (for places), product databases (for objects), and more contextual information about the people around me, what their contexts are – and what is mine. It is almost surprising to what degree this capability is non-existent today. Consider the discussion of video photography above. Now put Google Glasses on every policeman and consider the utility of simply recording every interaction these people have with the public. Put Google Glasses on every trainee driver and have them de-brief using the recorded video. Or just take it with you to your next classroom. Trivial capabilities like being able to tag an interesting point in time and immediately go back to it when you re-play – how useful is that? And considering augmented reality – think of simple logistic applications, like searching a warehouse, where the objects are tagged with some kind of QR code, and a simple scan with your eyes allows you to get a visual cue where they are. The simple applications will deliver immense value, drive adoption, experience, and through those – curiosity and new, further reaching ideas. 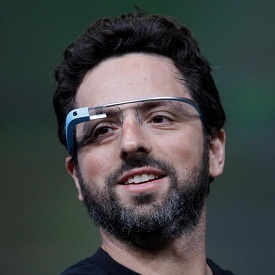 Wearing Google Glass grows your facial hair!